A tribute video to the greatest sprinter of all time, Usain Bolt! Three time Olympics Champion, the man who could cheat the speed. Enjoy! 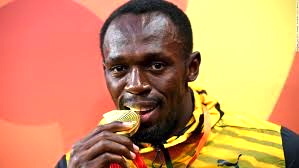 Bolt, 29, ran 9.81 seconds in his final Olympics to replicate his success at Beijing 2008 and London 2012. Twice banned for doping offences, Gatlin was 0.08 seconds behind Bolt, with Canada’s Andre de Grasse in third. De Grasse took bronze in a personal best of 9.91, ahead of Bolt’s Jamaican team-mate Yohan Blake. There was no British interest in Sunday’s showpiece as CJ Ujah and James Dasaolu were eliminated in the semi-finals. Bolt remains on target to leave Rio with a third successive Olympic treble, having won the 100m, 200m and 4x100m relay titles in 2008 and 2012. “It wasn’t perfect today, but I got it done and I’m pretty proud of what I’ve achieved,” he said. “Nobody else has done it or even attempted it. 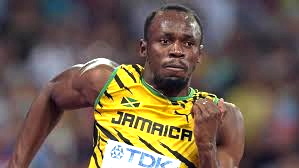 Bolt was slower out of the blocks than 34-year-old Gatlin, who was aiming to regain the title he won at Athens 2004. But the Jamaican surged through from 60 metres to pass Gatlin and comfortably win his seventh Olympic gold. Bolt received a hero’s reception as he walked out into Rio’s Olympic Stadium before the race – and the crowd chanted his name after his victory, too. “It wasn’t about the time, it was just about winning the gold and going out on top,” said Michael Johnson, four-time Olympic champion. 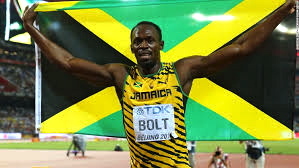 Bolt, who said in February he would retire from athletics after the 2017 World Championships, competes in qualifying for the men’s 200 on Tuesday, with the 4x100m relay beginning on Friday. The world record holder at 100m and 200m showed an expectant Rio crowd he was in great shape by clocking a season’s best 9.86 in his semi-final. The sport’s greatest showman then produced an even better run when it really mattered to send the Olympic Stadium into raptures. “After the semi-final, I felt extremely good,” Bolt added. 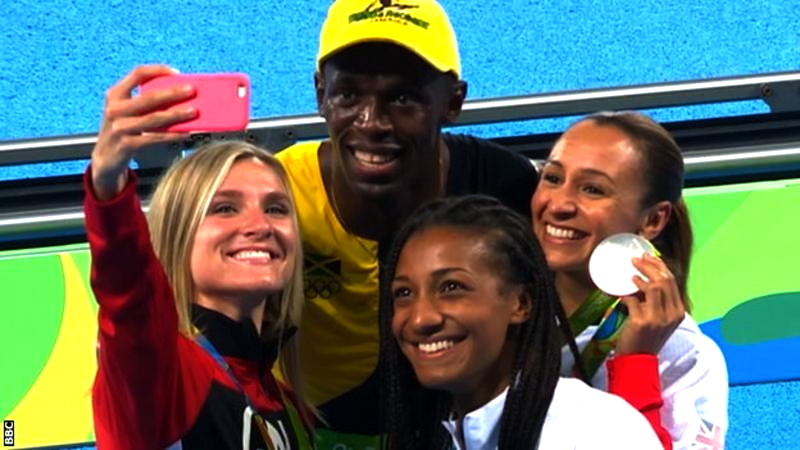 Britain’s heptathlon silver medallist Jessica Ennis, and fellow medallists Nafissatou Thiam and Brianne Theisen-Eaton, grabbed Bolt for a trackside selfie after his win.